There’s never been a better time to start a vegetable garden. 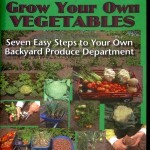 This DVD takes viewers through the step-by-step process of your lawn into a vegetable garden and covers soil preparation; planting, from seeds to transplants; weeding; watering; insects and pests; and harvesting and storage. If you’re finding that your grocery bill is going up faster than your paycheck, it’s time to turn your backyard into your local produce department.